Most dermatologists find lasers to be an exciting new technology for treating acne scars. The problem with the technology, however, is that it may be overused. Very few people who have active acne or acne scars respond to lasers used by themselves. They still have to have more traditional treatments, and neither acne nor scars can be removed with just one (of the usually quite expensive) treatments. 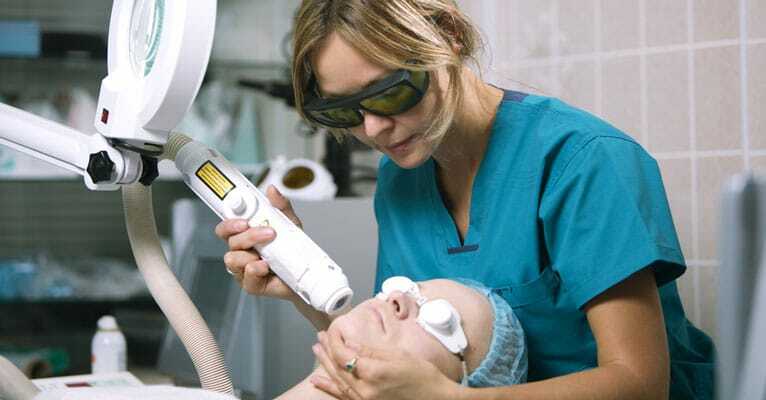 Laser therapies leave stark boundaries between treated and untreated areas of skin, and inflammation caused by laser therapy can leave lasting problems with excessive pigmentation on all but the fairest skin. Laser treatments can leave stark boundaries between treated and untreated areas of the skin. Of course, a second dermatologist might offer to treat the skin discoloration caused by the first dermatologist will still more laser therapy. Most doctors will try to establish “reasonable expectations” for laser therapy. They will persuade you, correctly, that you may still have visible scars even after you have four or five laser treatments. They will also try to persuade you, sometimes correctly and sometimes not, that no other treatment will work for you skin care needs. Let’s take a look at the other options you should discuss with your doctor when you are offered laser therapy. Dermabrasion is a process of wearing away the topmost layer of skin (about 1 mm or 0.04 inch) to stimulate new growth. It’s a method that is especially applicable to treating raised “box car” or chicken pox scars. It’s not a preferred technique for indented or ice pick scars. Doctors like dermabrasion because there are no disposables. After sterilization, they can use the same machine over and over again. Dermabrasion is a well-understood technique that has been around for about 100 years, so the way to get good results is well understood. The downside to dermabrasion is that the doctor or aesthetician still needs to have experience to make the technique work right. You probably don’t want to be their first patient. The whirring “sanders” cause a lot of skin particles to turn into an aerosol in the doctor’s office, and there is a real risk of catching an infection from another patient. Moreover, the doctor may need to treat your skin with an acid peel to make the areas treated with dermabrasion blend in with untreated skin. Microdermabrasion is a slower but far less expensive way to treat acne scars. Many people get good results with microdermabrasion, but it is necessary to use the treatment every day—at home—for months to get a cosmetically acceptable result. Excision, or acne surgery, is a procedure designed to replace an obvious scar with a less obvious scar. The skin is still scarred even after the surgery, but the edges of the scar may be softer or moved to a position on the face that is less obvious. Acne scar surgery requires both art and science. The dermatologist has to be able to visualize how the face will look from different angles, and to have a good idea of how the skin will heal. Surgery on darker skin is risky, since the inflammation and irritation caused by the surgery will trigger the release of pigments by the skin as it heals. On dark skin, acne surgery can leave not only scars by spotted skin making the scar even more visible. Dermatologists usually say their ideal candidates for surgical removal of acne scars have “realistic expectations,” that is, they will let the doctor off the hook if improvement is not especially noticeable. On the right skin types, however, acne scar excision can sometimes produce dramatic results in smoothing out ice pick scars and scars on natural relaxation lines in the skin. The author of this entry was introduced to skin needling in Japan. Many Japanese aestheticians use a hand held steel dermaroller about the size of a cheese slicer that is studded with tiny (0.3 mm) steel spikes. These spikes are not long enough to draw blood but they are long enough to reach into the top layer of the skin. The penetration of the skin stimulates the production of collagen beneath the skin and makes the basal layer of the skin stronger and firmer beneath acne scars. After several months of using the roller about 3 times a week, the contour of the skin becomes smoother and acne scars begin to fade away. Doctors in the rest of the world often use a similar process called skin needling, which is also known as dry tattooing (tattooing without ink), dermarolling, percutaneous collagen induction, and intradermabrasion. It is probably the safest approach to treating small acne scars on brown, golden, or black skin. That doesn’t mean it is without drawbacks. As it is practiced in the United States, skin needling can be a bloody procedure. (Using a Japanese steel dermaroller does not draw blood.) It is not something most dermatologists do every day, and since it is a relatively low-revenue procedure, they may give the task to an assistant. There is always a risk of infection, and the procedure can hurt. However, skin needling is inexpensive, requires no more than a day or two of downtime, and gets results—better results when it is used with other skin restoration procedures. Laser ablation of acne scars typically requires 3 to 10 visits that cost US $500 to $2000 each, paid in cash. Microdermabrasion may cost as little as $20 a month, and a Japanese dermaroller only requires a single $50 investment (considerably less if you buy the roller in Japan). Most other procedures cost about $200 at the doctor’s office or at a licensed spa. Do be sure you are putting your skin in well-trained, capable hands. You don’t want to get any of these procedures at a tattoo parlor (although licensed tattoo artists may understand the skin treatment issues involved) or from your hairdresser—unless they have specialized training, licensing, and insurance, as well as a professional relationship with a doctor and a hospital in case unexpected complications arise.